What up fellow geeks? This month has three superhero films that a lot of people can’t wait to check out. From Shazam! to Hellboy to Endgame you will have you going to your local theater a lot this month. Let’s take a look these three films. Which one are you most excited about? 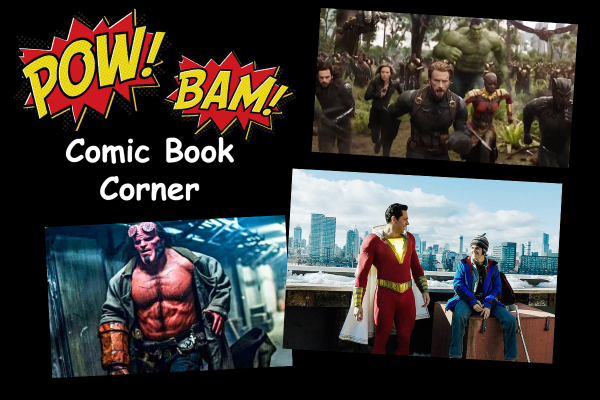 “Shazam!” also stars Jack Dylan Grazer as Billy’s best friend and ultimate superhero enthusiast, Freddy, part of the foster family that includes Mary, played by Grace Fulton; Darla, played by Faithe Herman; Eugene, played by Ian Chen; and Pedro, played by Jovan Armand. Cooper Andrews and Marta Milans play foster parents Victor and Rosa Vasquez, with Oscar nominee Djimon Hounsou as the Wizard. Firmly set in the DC universe but with his own distinctly fun, family-centric tone, the screenplay is by Henry Gayden, story by Gayden and Darren Lemke. Shazam was created by Bill Parker and C.C. Beck. The movie comes out next month. From my fellow geeks that have seen the movie already I have heard that there is action and humor. Plus the theme of family is key to the film. We here at Life of Dad like the sounds of that. Levi does such a great job playing Shazam that your kids will want all the figures and playsets from the movie. There are action figures in the 6 inch and 12 inch variety as well as some dress up items like Shazam’s signature lighting bolt chest set. All of these items can be found at Entertainment Earth! They have a great selection of toys, collectibles and all things geek that you can imagine. HERE. WE. GO. I think for geeks and non-geeks this movie is the one people will be talking about over and over as well seeing it in the theater over and over. This movie is 10 years in the making. I know I can hardly wait to see what happens to Cap, Iron Man, Hulk, Thor and all of the other Marvel characters as they try to avenge their fallen heroes. Many people have their own theories, but on April 25th during the early screening day fanboys and fangirls will get to see this chapter in the MCU.